“Let’s go, amigo!” Prepare to rewind time and find yourself in Mexico of old as you join a band of gun-toting bandits who are hell bent on holding up a train and escaping with all the shiny gold bars that are on board. While they might not sound like the people you’d like to associate with, the share of the spoils you’re guaranteed will prove too tempting to refuse, so get ready to unleash the inner bandit in you! Stick on your sombrero, pull on your poncho and grab a gun as you join the bandits on a sun-soaked stretch of track in the wilderness surrounded by mountain views and cacti as you nervously wait for the gold-carrying train to make its way towards you for the much-anticipated hold up. Consisting of 5 reels and 20 fixed paylines, you can join the band of bandits in Amigo’s Gold from as little as 20p up to £200 per spin, and you’ll be glad you did so when you discover the variety of bonus features that have been included. This includes three fantastic bonus games which can be activated using their associated Scatter symbols, a massive progressive pot which can be win in three different ways, plus a random Mexican Mischief feature which sees an animated gun-toting bandit appear on screen to award prizes and multipliers all while laughing mischievously and frantically firing his gun! As you soak up the sun you’ll see metallic styled Wild symbols representing the railway track which are worth up to 500x your stake and can substitute for all but the three Scatter symbols. There is also an Amigo’s Gold logo, a sombrero, maracas, and Ace to 9 icons designed in a stitched fabric style. 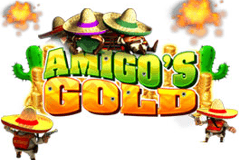 While the sun is always shining brightly as you stand by at the railway track in Mexico, things heat up even further thanks to the selection of bonus features that Blueprint Gaming have included in Amigo’s Gold, with the following three guaranteeing you red-hot action on the reels. Chilli Hot Free Spins: Things spice up with a free spins feature once you land the Chilli Hot Free Spins symbol on the second, third and fourth reels at the same time as our quirky little bandit friend pops onto the reels and awards you with up to 25 free spins. While there is no multiplier bonus applied to your winnings, there are additional Wilds and Bonus symbols on the reels throughout to boost the odds of you winning big. The Big Train Robbery: When the Bandit Scatter symbol appears three or more times on the same spin it means the train is about to pass by therefore it’s time to hop on your horse alongside the other bandits in anticipation of boarding it and locating all the gold. You’ll be spinning a gun chamber to move along the train carriages, firing the door open to reveal cash prizes, with up to 1,000x your stake available. Tequila Shootout: To celebrate the train heist you’ll join the bandits at their local drinking hole where they are still in a gun-toting mood and encourage you to shoot bottles of tequila to reveal cash prizes worth up to 500x your stake, plus there is extra ammo that can be revealed to ensure you don’t run out of bullets and can claim as much as cash as possible! Who doesn’t love a progressive jackpot? While the gold loot from the train robbery never fails to boost your balance, it’s scooping the progressive pot which will really make the trip worthwhile – you’ll certainly not have to risk your freedom by committing crimes again! The value of the progressive pot is visible above the reels throughout gameplay and Blueprint Gaming have generously offered three ways to win it. The first is to shoot all the dancing chilli’s during the free spins mode, the second is to reveal the Progressive Pot symbol during the Big Train Robbery feature, while the third is to reveal the Progressive Pot symbol in the Tequila Shootout feature. With three chances to win, it’s tough not to get excited! While you may try to be whiter than white and not step a foot out of line, you’ll be overjoyed that you unleashed the bandit within you on this Mexican adventure as you mingle with gun-toting bandits. Not only are the graphics fantastic with a stunning sun-soaked setting and an absorbing theme, the bonus features that Blueprint Gaming have included make it so fun and lucrative that you must become one of the amigo’s so get ready to fire your gun and down many shots of tequila!